Let’s face it, baby’s first birthday is just as much a celebration for you as it is for them. It’s a celebration you all made it through the first year! Your little one isn’t going to remember what happened on their first birthday, so technically you could do anything on the day. However, that doesn’t mean you can’t make it special. If you’re struggling for inspiration, below you’ll discover 10 awesome ways to celebrate baby’s first birthday. If you’re looking for something you can treasure and look back on in years to come, a baby’s 1st birthday collage is ideal. It’s basically a visual collection of the important milestones and your baby’s favorite things throughout the past year. If you’re not confident in your creative abilities, you can always create one on the computer and then print it out. Whichever way you choose to do it, or what theme you go for, the top things to include in the collage could be baby’s current weight, their favorite toy, food, book or activity, the words they can say and their favorite songs. Then complete it by adding “Happy Birthday” with the date, either to the top or bottom of the collage. This gives you something both you and your child can look back on and it’s a beautiful, sentimental gift. If you’re not one to go over the top with disposable decorations, putting up a banner and balloons and having a mini family birthday celebration is a great idea. Why not opt for a banner and balloons you can use year after year too? That will save you money in the future and will actually start a little tradition too. Everyone loves to have familiarity in their lives; especially during special occasions. So, doing this one simple thing will provide your child with something to look forward to each year. You can just tweak what you do to celebrate in addition to the banner and balloons as they get older. For now, simply enjoying a nice, small family meal or a special birthday playtime session will provide you with a memorable first birthday which fits in with your lifestyle. As your baby won’t remember their 1st birthday, why not create something they can look back on when they’re older? A family photo shoot is a perfect first birthday idea. It gives you and your partner a chance to dress up nice too which is a treat in itself! Don’t have the money to pay for a professional shoot? Maybe you know a family member or friend who is particularly skilled at taking good photos? If not, you can still host your own photoshoot, even if you only have your smartphone to work with. Cell phones these days come with pretty impressive cameras so you don’t necessarily need a lot of money to do a photoshoot. You can also be creative and choose your own fun theme. It’s an idea you can do anywhere too, whether it be in the comfort of your own home or a photoshoot at the beach; wherever you choose to have the photoshoot, it’s guaranteed to give you precious memories you can look back on in years to come. Babies outgrow their clothes pretty quickly. Instead of giving all of your baby’s onesies to friends, family and charity stores, why not keep some of your favorites and use them to create a memory quilt? If you’re not great at sewing, there’s actually people out there who create memory quilts for a living. O, you could pay to have your baby’s old clothes turned into an everlasting, precious keepsake. It doesn’t have to be a quilt either. You can also choose to have old clothes transformed into teddy bears or cushions. Another keepsake idea that’s perfect for baby’s first birthday is a finger and footprint. You can buy specialized packs online which allow you to create long-lasting molds of your baby’s feet and hands. You can frame them and stick them on the wall or simply keep them safe ready to bring out when your little one is older. If you’d prefer to avoid working with molds, you can also do this idea on a budget, opting to use baby-safe paint instead. All you’ll need is paper, paint and a frame. Similar to the 1st birthday collage idea, you can also turn baby’s favorite things into a memory frame. You can put things like your baby’s first teddy bear, a scan picture you received from the hospital, a photo of you holding baby when they were first born and one of their first shoes. This creates a beautiful collage of sentimental moments you’ve shared over the first year. It will look great on the wall, or stood on a side table. A lot of parents hold off visiting big attractions with their baby as they feel they’re too young to really appreciate it. However, a trip to the zoo for example, is an awesome outing for baby. They’ll be mesmerized by the different animals and sounds. You could even combine this with the photoshoot idea. Just remember your baby has a limited attention span so don’t plan to be out all day. Also, factor in any nap and feeding times before you go. One of the more unusual ideas on the list, but also one of the most sentimental is to write your child a letter on their first birthday. This is a great additional present idea which you can give to your child when they’re older. You can even make it a tradition to write a letter on their birthday each year. That way, when they turn 18, you can give them the letters that you’ve written over the years, giving them memories they will treasure forever. Make it even more special by adding a photo to the letter each year too. Babies love to read and when they reach the toddler stage, they’ll really appreciate having their own personalized books. Children can re-read books over and over again without getting bored. So, investing in a personalized book for baby’s first birthday will give them something they’ll enjoy for a few years. You can easily order your own personalized baby books online, or if you’re a good storyteller, why not create your own? Some parents prefer to spend baby’s first birthday having their own celebration. As baby is too young to remember anything, it’s a great time to focus on just you and your partner. That isn’t to say you need to leave baby with a babysitter on their birthday, but after they’ve gone to bed you and your partner can then enjoy your own little celebration. It’s so difficult to spend quality time with one another after baby arrives. So, taking the time to enjoy a nice meal together or a simple movie night, helps you to maintain the bond between you and reignite that all important spark. 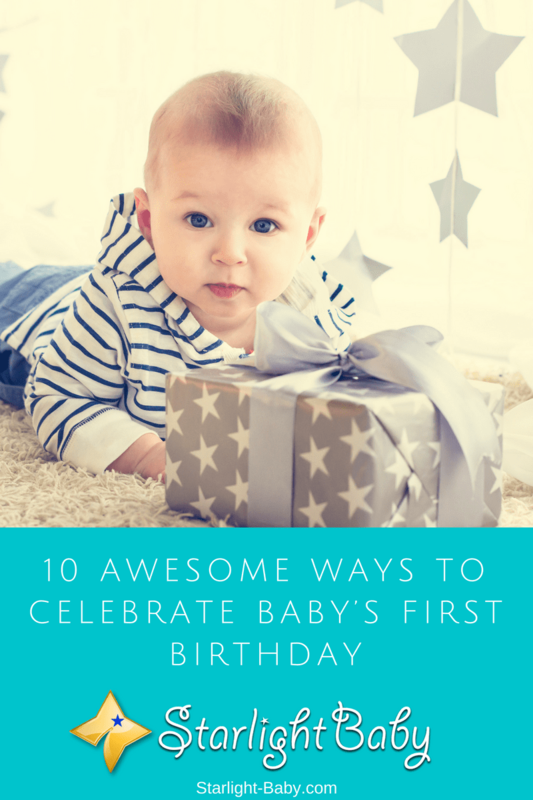 So, there you have it, 10 ways to celebrate baby’s first birthday. The traditional way is to host a 1st birthday party, but as you can see above, there are so many other great ways you can mark this very special occasion. My baby is just about three months, however, I am already thinking about his first birthday. You have presented interesting ideas. Creating “a baby’s first birthday collage” is a very interesting idea. In the last three months I have captured some of the precious moments, for example, when I saw the baby for the first time, when wife began feeding the baby through her breast for the first time, when I took the baby in my arm for the first time, when baby had his first bath etc. Well, my little boy already had his first birthday but regardless, all of those ideas can be applied to any sort of birthday so thank you for that! I can share with you that we’ve done the balloons and the finger print picture already and it was so much fun. Which child doesn’t love balloons? Ours sure does. He enjoys hitting and catching them so much so for one of his birthdays we hired the guy that blows up balloons in different shapes. All the kids loved it! After that, we gave them some finger paints and even though it got messy it was worth it. We might try to do the personalized story book for this year, it sounds amazing. You’re right. I don’t think any child could resist a balloon. The balloons with different shapes is particularly interesting and fun for kids! Good of you to have thought of that. And yes, I think the personalized storybook sounds great, too! And I also love the baby collage. It’s something the child would really have fun looking back to when he/she is all grown up. Well, my baby angel is now approaching her 1st birthday celebration of her life and I want to celebrate it very special together with her pals. I have to prepare the balloons and other stuff that my baby will enjoy it. I have to create a collage that will treasure her memories until she became a teenager. I love all of those ideas that you share above, it’s very useful. Thank you for posting your article online I found it very valuable, simple and practical. I’m really excited for you and your baby! That is a momentous milestone in your baby’s life. You should enjoy it. I agree with you, I also love the idea of a collage. I wish I’ve known these ideas when my kids were still young. They would have had something to look back to today. My baby just had her 2nd birthday and I remember well when she had her first. It was not that much just a little preparations. Close family were the only ones invited and a few balloons to color up the venue. I still believe how you celebrate things is important but the top priority is that it will be memorable to the baby since it is her first. Photos and collages were made and a video that we can watch again and again. It is the meaning that brings the best of any occasion whether simple or fancy. That is so true, jojo. A child’s birthday need not be grand. The important thing is that it is celebrated with loved ones and people who love the child. Be sure to take lots and lots of pictures that your child can look back to when she’s all grown up. I’m sure she will really have fun doing so. I know of this because my kids and I usually have a good time when we get the time to browse through their photos when they were young. Sometimes they just don’t believe it’s them in the photos, haha, or laugh at the way they look in the pictures. It’s a great way for bonding. I attended my cousin’s birthday celebration last Sunday and I must confess that the experience I had there was worth it with the way my little cousin, who just turned one year, was crying as the photographer took pictures of him looks funny and it is one of those photos he would laugh at when he has come of age to comprehend major things. The parents used banners to write some things such as the first words he spoke while wishing him a happy birthday at the end of those write-ups. However, I think I have read this earlier than now for I would have made some of these suggestions to them such as writing a story book for him so that it would be part of the wonderful memories he would fall back on when he is old enough to read and write. Truly, I enjoyed every bit of the birthday celebration and I’m already looking out to having my kids soon when I get married. Congratulations to you and your wife, jose! With God, all things are possible so good luck with your plans of having a baby. We wish you the best! I’m sure your baby will have so much fun when you eventually use these projects on future birthdays! This is a really good things to take note of to make your kid’s first birthday special. How I wish I had finger and foot prints, unfortunately, it wasn’t much of a thing in our place at that time. I’ll surely remember to do this though when I get to have a baby of my own. Making a letter to your baby is fantastic idea too. My parents used to make this when I was kid and although I have read those countless of times, they still touch my heart and bring a smile to my face. It’s great to remember how treasured and loved I was as a baby. I still am, but it just feels different because I have no memory of any of those events. But seeing those pictures, and reading those letters make me appreciate that event, especially looking at those photos where I can see how happy and proud my parents were having me. When I have my own kid someday, I’ll make sure to remember and do all these. I want my baby to know how loved he or she is, and what best to show it through these right? It’s really awesome of your parents to have thought of writing those letters and taking your baby photos. I’m sure things like that will always bring a smile to anyone’s face. I wish I have done this for my kids. The idea never crossed my mind (but I was able to take their growing up photos and compiled them in an album, at least for my first two kids). I hope to pass these tips to my kids when they start having their own familiy. When I will have my own baby after some years I will celebrate his/her first birthday with a blast party and I will use all the 10 ideas you mentioned. The best one is the fingerprints one. Like Mahesh said, when I finally have my first child, I’ll be sure to make the first birthday celebration a blast using majority of your tips to make it extra special for the little one and the family as a whole. The tip on “write a letter” touched a nerve on me. My parents made sure a thousand pictures were taken during my first year celebration which I find pleasing going through every now and then, but I’ve always wondered what my parents inner thoughts back then. Writing a letter would have absolutely satisfied me more than pictures. It’s a great tip and I hope everyone could do that. Well, the idea of writing you a letter probably never crossed their mind, too. I say this because it never crossed my mind as well, and I never got to do such for any of my kids either. I really wish I have known these tips back then. I love to write and I would have written them a lot of letters about the funny things they did when they were growing up. I hope I could do this for my grandkids when I already have them. I am very happy after reading this blog because I did 50 percent of the suggestions here like Create Memories With A Family Photo Shoot, Finger And Foot Prints, Create A Memory Frame, Visit A Family Friendly Attraction and Give Them A Personalized Story Book. I guess if you get pregnant for the first time, you’re always excited like I took pictures of myself with my baby bumps. When I gave birth, my husband took pictures of my newly born baby as his first photo. Every month I always see to it that I took pictures of him as memento or shall we say sovenier while he is growing. Every moment of my baby from his first step, first solid food, first tooth, first word, first travel, etc., I write it in a diary with a photo. I was thinking that this will be my best gift to him when he got married someday. I’m glad I did all of this because you can never back time. Good for you, Belinda! You’re lucky to have bumped into these ideas, and was able to use them right away. Take all the photos you can, and create all wonderful memories together. These are things a child will never forget in his lifetime. Giving them a personalized story book would be nice idea. It’s gives me excitement though not for me but I could suggest to a friend who’s undecided what to do in celebrating the 1st birthday of her daughter. This idea would make a difference from the traditional way. Memories will be more fascinating and special. Anyway having the traditional party will always do but having this is like giving a personal touch to the first year of your child. Birthday celebration for babies and even adults are very memorable events in one’s life that even though they are still little but with such memories kept and stored in pictures, collage, frames etc would aid the kid relieve the moment as if it’s still fresh. This is the beauty of keeping picture memory, as long as it’s kept safe, it doesn’t go to waste. Personally, I find creating memory quilt very interesting as these clothes or shoes kept when being look at in the future time would just make both the parent and kid laugh. This is why I still can’t forget the loose of my kids right away, I could have celebrated them in such a way that it’s memories would never be gotten too easily, there are couples out there expecting their first child but they are not even aware of how difficult it is for people to want that same child they have that is not being treated specially by them. I hope someday if it truly comes to be I will celebrate their first birthday in styles, I would have love to have those photographs and that letter which I will write to my kids, if wishes truly were horses. I don’t want to get emotional right now because it truly hurts when you get to see posts like this and you not capable, keep up the good work of spreading this messages. I have always been intrigued by the use of Finger And Foot Prints to keep a long lasting memory of one’s kids life and birthday experience. With a colorful paint dipping both hands and feet in the paint and using a particular wall in the room to stamp on it. I have seen it done in several movies and I have started copying some of it.